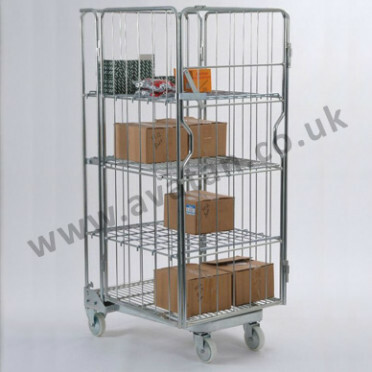 Avatan Handling Equipment offer cost effective and economical roll containers, roll cages and bespoke trolleys with many new and second hand items available from stock. We offer a wide range of nestable and demountable roll containers. ‘A’ frame roll containers, used extensively within the retail and distribution sectors are available with two, three, or four sides. Our most popular roll container however, both for sale and for hire, is the security nestable roll cage with mesh infill in the sides, gates and lid. 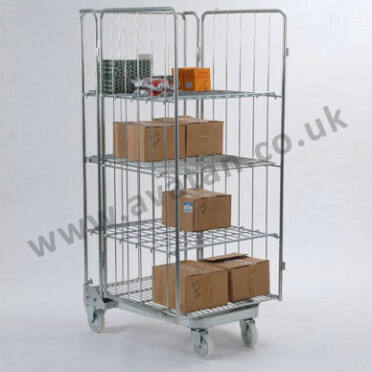 This fully lockable trolley can be sealed using plastic seals or padlocks. Two and three sided roll containers may be supplied with retaining straps. Our distribution roll cages are fitted with smooth running fixed and swivel castors enabling the roll container to be easily manoeuvred. Even when fully loaded with up to 500kg, our roll cages can be easily loaded onto tail lift trailers. Castors may be fitted with brakes for added safety and with string or thread guards to reduce their likelihood of jamming. Finished in bright electro zinc plate, roll containers are easily cleaned, are hard wearing and durable. Nestable and demountable roll cages may be dismantled or nested minimising the space required for empty storage and return transportation. If damaged, castors may be easily and economically replaced. The main benefit of nestable roll pallets is that no parts can be mislaid. All parts are integral. The benefit of demountable roll pallets is that individual parts may be replaced if damaged or mislaid. 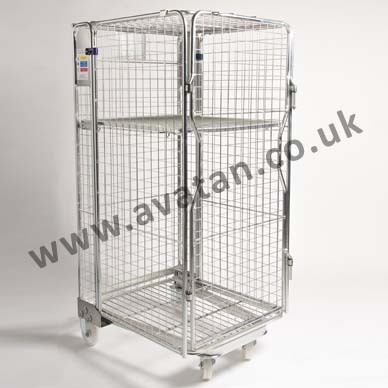 At Avatan Handling Equipment, we pride ourselves on being able to supplying quality roll containers at affordable prices but do also offer bespoke roll pallets, roll cages, trucks and trolleys, manufactured to order.